NEW YORK — April 20, 2011 – Marking a North American premiere at the New York International Auto Show, Porsche today showed two new versions of its highly acclaimed Panamera four-door sports sedan, including the company’s most fuel-efficient car ever — the 2012 Panamera S Hybrid — and its highest-performance Panamera ever, the 2012 Panamera Turbo S.
With its new four-door Panamera Turbo S, Porsche is establishing a new benchmark for its competitors by delivering ultra high performance and efficiency, sports-car-like driving dynamics, and first-class comfort in a purely Porsche package. The power under the hood of the new top-of-the-line Panamera is based on the proven twin-turbocharged 4.8-liter V8 engine in the Panamera Turbo. In the Turbo S this powerplant generates 550 horsepower, 50 more than that of the Panamera Turbo. The torque is also increased significantly over the Turbo from 516 lb-ft to 553 lb-ft. Even more torque — 590 lb-ft — is generated temporarily by the “Sport” and “Sport Plus” overboost mode of the standard Sport Chrono Package Turbo. The increase in power in the Panamera Turbo S is the result of a quicker, more responsive turbo response and modified engine control unit. 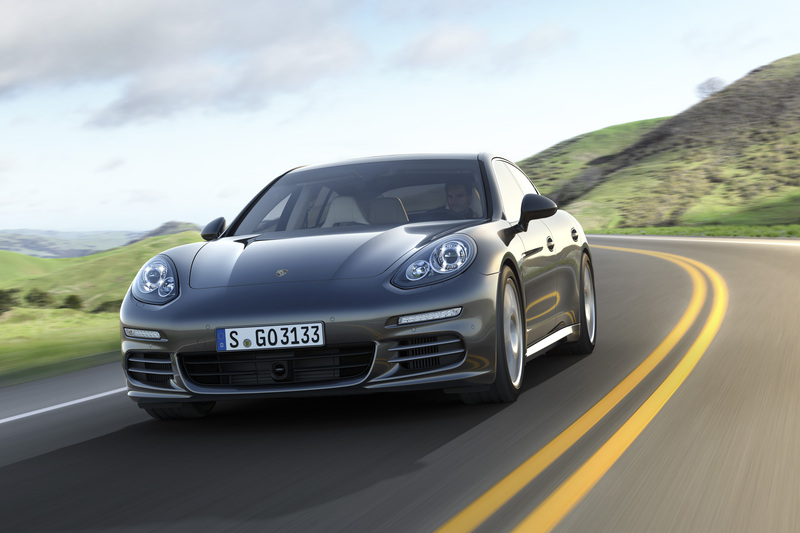 With the help of Launch Control, the newest Panamera can reach 60 mph in just 3.6 seconds. The top-track speed is 190 mph. And despite this increased performance, fuel consumption is expected to remain comparable to the Panamera Turbo that delivers an EPA estimated rating of 15 mpg city/23 mpg highway. Official EPA fuel economy estimates for the Panamera Turbo S will become available prior to the car’s on-sale date later this spring. 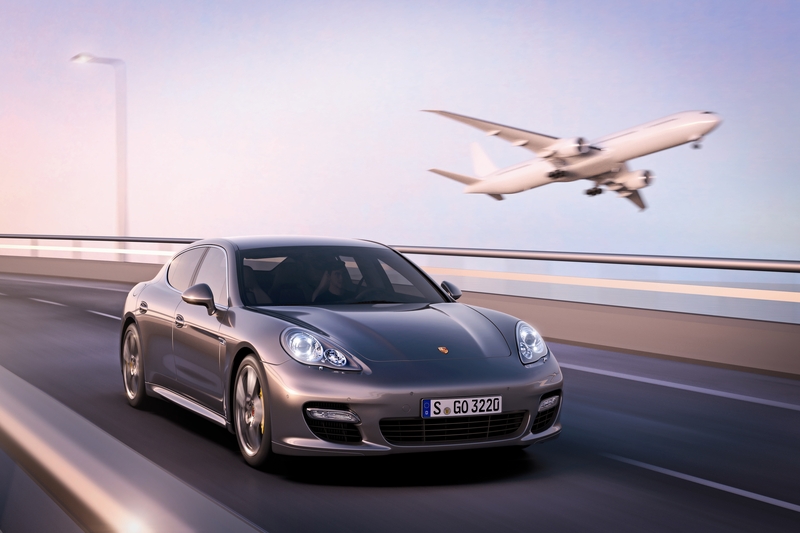 Even for a world-class luxury car, the Panamera Turbo S offers an extraordinarily high level of features. 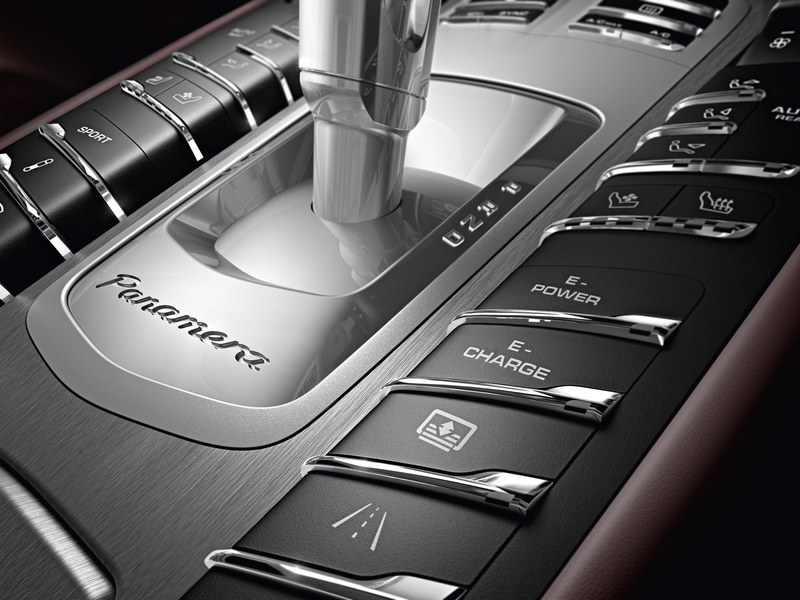 In keeping with its sporty concept, it comes equipped with the most important driving-dynamic control systems. For example, Porsche Dynamic Chassis Control (PDCC) is an active anti-roll system that significantly reduces lateral body movement during corning, which enhances stability, handling and overall occupant comfort. Porsche Torque Vectoring Plus (PTV Plus) is also standard and works to help ensure superior traction and higher-performance cornering by applying a variable torque split to the rear wheels in combination with an electronically controlled rear differential lock. 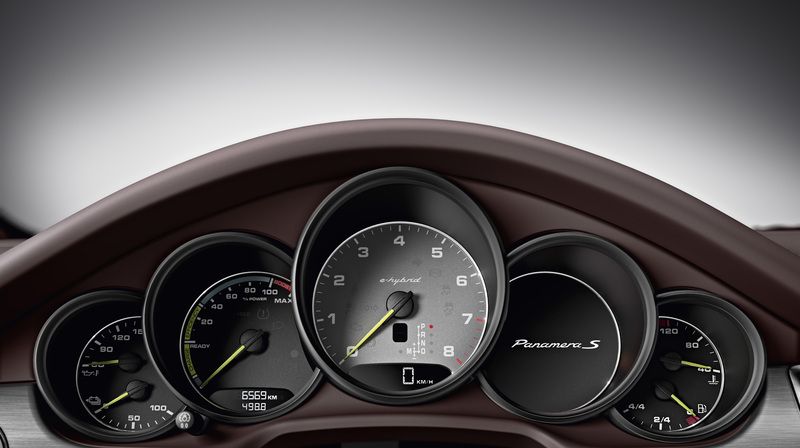 Also standard is Porsche’s advanced speed-sensitive Servotronic® steering system, a sports exhaust system, and the Sport Chrono Package Turbo that further tunes the engine and suspension at the touch of the “Sport Plus” button. While the sporting character of the new Panamera Turbo S is most apparent behind the wheel, the car’s exterior tastefully exudes its high-performance ambitions. The new 20-inch Turbo II wheels with increased rear axle track width, side skirts from the Porsche Exclusive range, and the adaptive four-way extending rear spoiler express the car’s elite performance abilities. 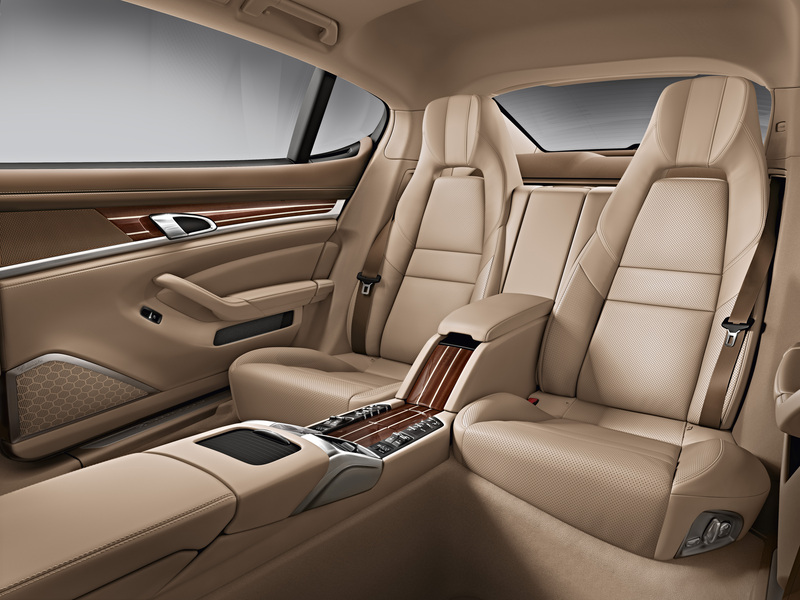 Inside, the fusion of exclusivity and sportiness is conveyed in the interior by the standard bi-color leather finish. A new combination of black/cream is offered exclusively for the new Panamera Turbo S with Agate Grey/cream also being added as an exclusive option later this year. Agate Gray Metallic will also be an exclusive exterior color. The new Porsche Panamera Turbo S will have a base MSRP of $173,200 (excluding destination). 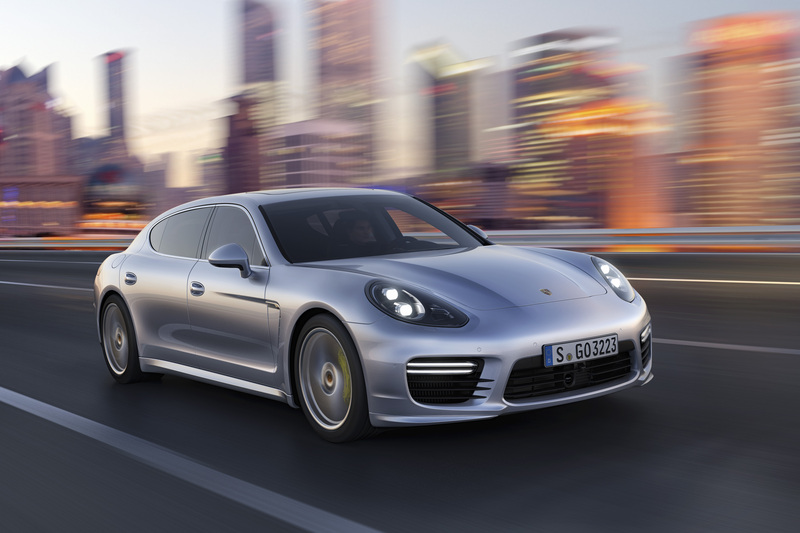 The debut of the Panamera S Hybrid adds another important chapter to the Porsche Intelligent Performance philosophy of committing to build new cars that strive to deliver sportier performance with more fuel efficiency and lower emissions. 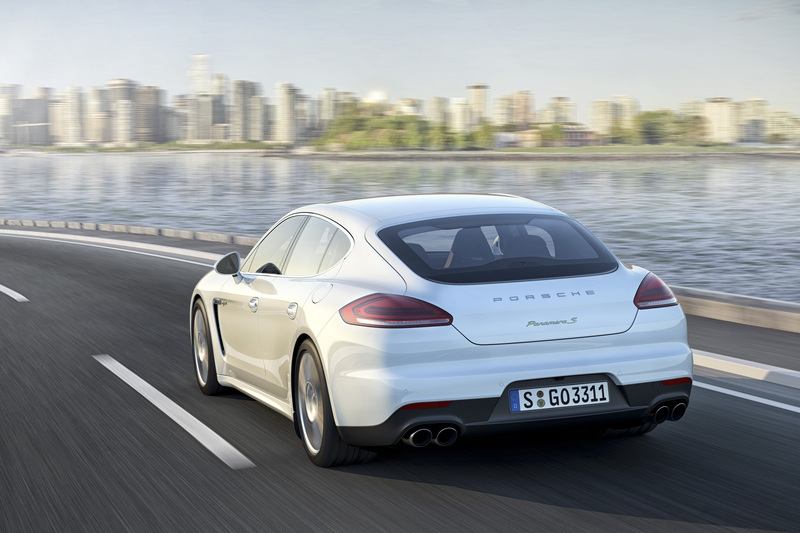 Without sacrificing high-performance or luxury and comfort, this new Panamera model produces 380 horsepower with fuel consumption of only 6.8 L/100 km on the New European Driving Cycle (NEDC), making it the most fuel efficient Porsche of all time. Official EPA fuel economy estimates for the U.S. will be available closer to the car’s on-sale date late this year. 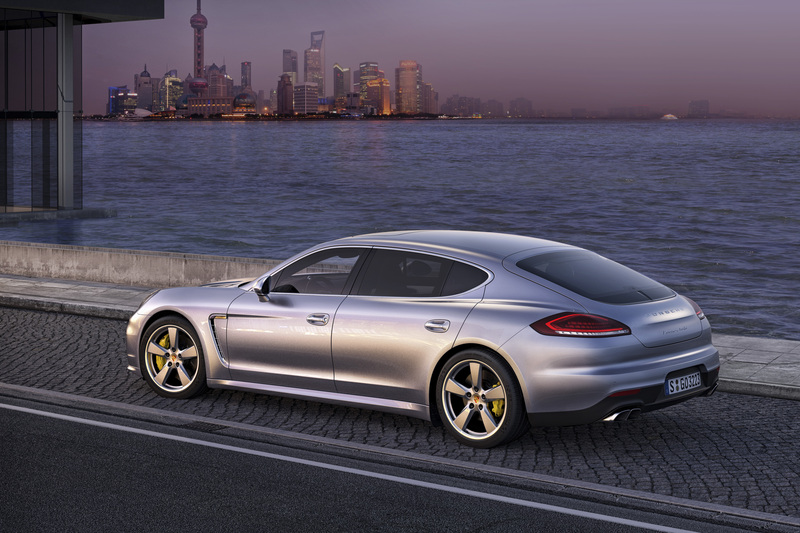 As you would expect from Porsche, the Panamera S Hybrid sets new standards in terms of performance as well as hybrid efficiencies. It accelerates from 0 to 60 mph in just 5.7 seconds and has a top track speed of 167 mph (270 km/h). Its range in purely electric mode is approximately one mile, with electric-only acceleration possible up to just over 50 mph (85 km/h). The Porsche parallel full hybrid system also reduces consumption at high speeds thanks to its ‘sailing’ or coasting mode. When the driver lifts off the accelerator at normal highway cruising speeds, the gasoline engine is completely switched off and disengaged from the drivetrain by a decoupling clutch. This eliminates the combustion engine’s drag forces and braking effect in the interest of lower resistance, fuel consumption and emissions. As soon as the driver presses the accelerator, to pass another vehicle for example, the gasoline engine smoothly starts within fractions of a second and engine rpms are increased to match the current vehicle speed. It does this seamlessly thanks to the Hybrid Manager, which also helps the Panamera S Hybrid accelerate dynamically in gears at higher speeds. 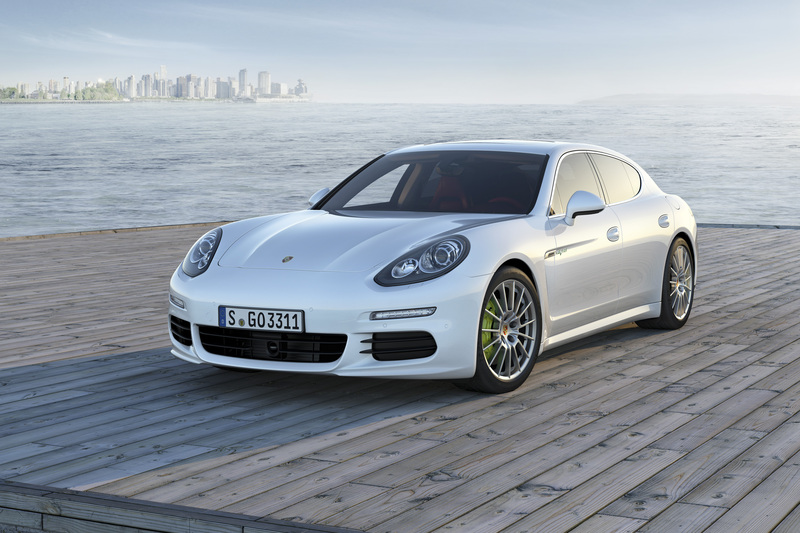 The Panamera S Hybrid employs a 3.0-liter supercharged V6 engine that delivers 333 horsepower. It is supported by a 47-horsepower (34 kW) electric motor. Depending on driving conditions, either drive unit can operate independently or together to drive the rear wheels. The electric motor, which also serves as the car’s generator and starter, combines with the decoupling clutch to form the compact hybrid module located between the combustion engine and the transmission. The electric motor is connected to a nickel metal hydride (NiMh) battery that stores electric energy recovered from braking and other driving situations. The transmission is the same eight-speed Tiptronic S fitted in the Cayenne models, with a wide range of gear ratios. 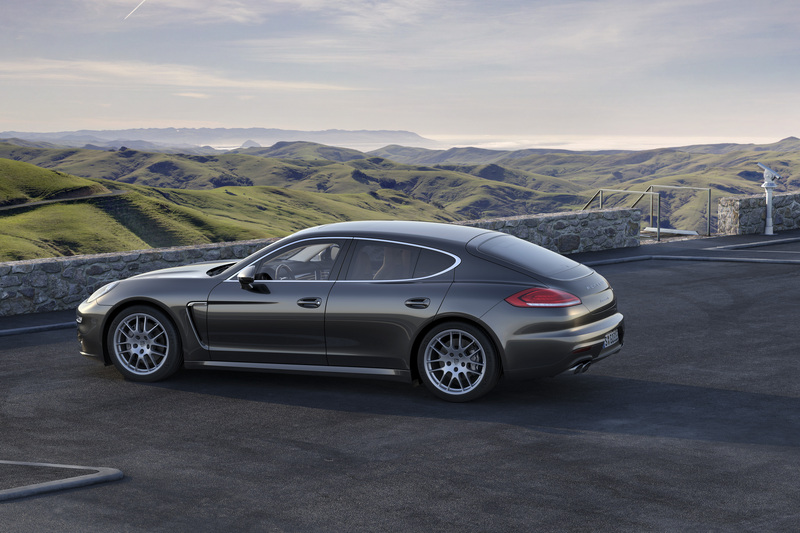 The Panamera S Hybrid has an even higher level of standard equipment than the V8 Panamera S that includes Adaptive Air Suspension with the Porsche Active Suspension Management (PASM) adaptive shock absorber system, Servotronic® variable-assist power steering and a host of other features. This new model also features an innovative display that provides the driver with relevant information about the status of the vehicle’s hybrid drive systems. 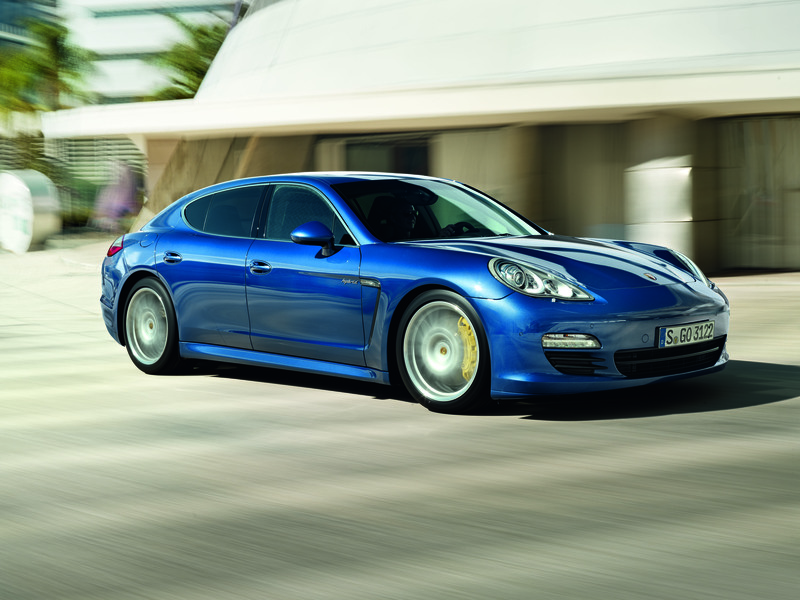 The Panamera S Hybrid will go on sale in the United States later in 2011 at a base suggested retail price of $95,000 (excluding destination). 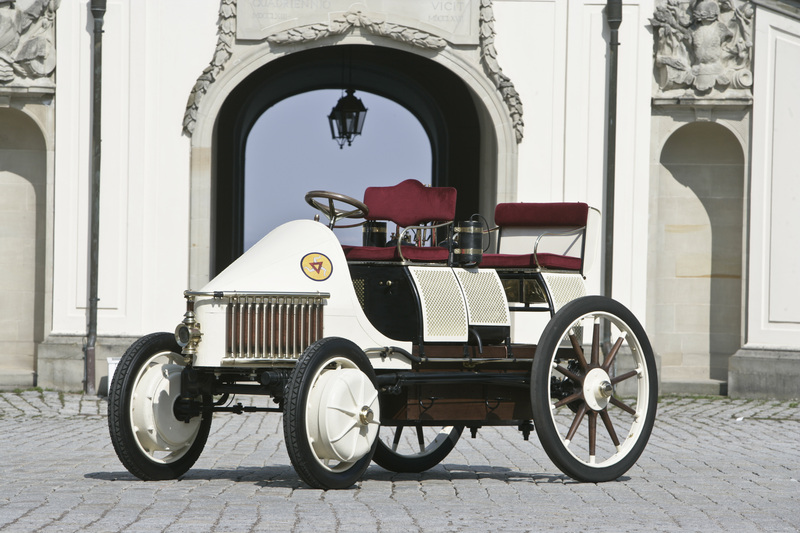 In 1900, history came to life when Professor Ferdinand Porsche built the first functional hybrid car. Aptly called Semper Vivus, which means “Always Alive” this historic car has been resurrected 111 years later by Porsche as a tribute to this acclaimed engineer’s visionary thinking. The fully functional Semper Vivus replica, based on original drawings and exhaustive research, is a collaborative effort between Porsche Engineering and Karosseriebau Drescher, a coachbuilding company based in Hinterzarten in the state of Baden-Württemberg, Germany. Its masterful design impresses onlookers to this very day, and for the first time in the United States it is on display at the New York Auto Show press day on April 20. In November 2007 the Porsche Museum embarked on one of the most interesting and challenging projects in its history: the construction of a faithful replica of the 1900 Lohner-Porsche Semper Vivus. Even 111 years after its invention, building the world’s first functioning hybrid car was a great challenge for all. Ultimately it was not just about an extreme attention to visual details but also achieving the same driving performance as the original. The Porsche Museum entrusted the workmanship to a team of experts led by coachbuilder Hubert Drescher, who had already proven his competence in numerous difficult restoration projects. As with a number of racing car projects, the aluminum body of the Porsche Type 64 museum exhibit originates from the Hinterzarten coachbuilder workshop, as well. Exhaustive research in various archives the across Europe was the first step. The outcome was a handful of black-and-white photos and an original technical drawing serving as the project’s foundation. As with Prof. Porsche, the Semper Vivus replica initially began as a blank sheet of paper. This meant that in addition to a good deal of imagination, the project required extensive research and calculations in order to be faithfully recreate an accurate and working likeness of the electric wheel-hub motor. Since no specifications or other helpful records had survived, experts initially created ready reckoners and design drawings on graph paper in the time-honored fashion. This involved the painstaking study and laborious measurement of photos and drawings. As there was no functioning wheel hub motor in existence, technical details such as performance and range had to be resurrected and calculated from scratch. The replica car’s genius rivals what it took to build the original. What can be seen now took three years to build and ingenious engineering and craftsmanship, as well as a treasure hunt for original parts, including some for the combustion engine. Today, Prof. Porsche’s innovative spirit lives on at Porsche, as a priceless historical creation and as an inspiration for the company’s commitment to developing new and ever-more advanced hybrid systems. SOURCE: Porsche AG / Porsche Cars North America, Inc.